In April 1881, in the southern province of Finland, in the town of Iittala the Swede, Petrus Magnus Abrahamsson, after having left the Nuutajärvi glassworks, founded the Iittala Glasbruks Aktiebolag. Due to the lack of skilled glassblowers in Finland the first 17 glassblowers came from the Limmared glassworks in Sweden. They along with the local Swedish glassblower Johan Fredrik Gauffin, who was part owner, made the first glass objects on November 24th 1881. In February 1888 Abrahamsson left the loss-making Iittala glassworks and Anders Andersson the chairman of the board took over the directorship of the Iittala glassworks. In 1865 the Swede, Anders Norstedt resigned as administrator from the Nuutajärvi glassworks and moved to Helsinki to handle his business interests. By 1895 Anders Norstedt was the majority shareholder of the Iittala Glasbruks Aktiebolag. Claës Norstedt, the son of Anders Norstedt started at the Iittala glassworks in autumn 1895 as a clerk. Later he became the factory manager and in spring 1896 after his father’s death Claës Norstedt was promoted to deputy director. Claës Norstedt was highly qualified and is the first Finnish professional in the field of glass but he was content just managing and supervising technical aspects at the glassworks, so he travelled throughout Finland on many commercial business trips. It was during his tenure that the Iittala glassworks enjoyed its first boom. In 1898 a second directly fired glass furnace with five crucibles had to be built to meet demand. One furnace was used to blow pharmacy glassware and the other furnace made household glass and crystal. An initiative by Norstedt resulted in Iittala’s iron mould foreman, Alfred Gustafsson becoming the first in-house designer at Iittala glassworks. In 1903 Gustafsson created the glass series Great Men to passively protest Russian rule. In 1917 due to the First World War raw materials began to become difficult to obtain, inflation caused prices to rise and wages soared resulting in Norstedt giving up the Iittala glassworks. Karhula Oy, part of the A. Ahlström Group (a timber refinery) bought the Iittala glassworks and Norstedt resigned from the board in March 1917. Up until 1910 – 1920 Iittala glassworks produced glass wares using imported moulds resulting in products being very similar within Finland and abroad. In time the entire ownership of Iittala stock went to the Ahlström Group. Though Iittala no longer existed as an independent company, Iittala continued to have a separate corporate identity until 1935 when the Iittalan Lasitehdas Osakeyhtiö was formed with the Karhula Company. From then on products were produced under Karhula-Iittala. 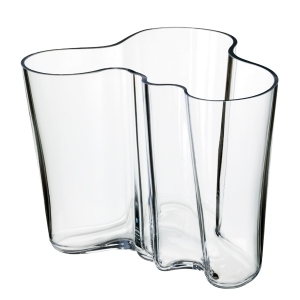 In 1932 Göran Hongell, was hired by Karhula-Iittala and became the first designer hired for a Finnish glassworks. Hongell initiated collaboration between designers and glassblowers by bringing drawings to the glass workshop to ask about technical aspects of blowing the object. At the Karhula-Iittala design competition in 1932 Aino Aalto’s famous Bölgeblick won second place. Bölgeblick tumblers went into mass production in 1949. They were discontinued in 1960 but production restarted at the Karhula glassworks in 1983. Since 1994 the Iittala glassworks took over the production where they are still being made to this day. With demand for bottles and glasses increasing since 1932 Hans Ahlström from the Ahlström Group started to modernize the Karhula and Iittala glassworks in 1935. Ahlström officially divided the production of Karhula-Iittala products in 1937. Iittala glassworks would concentrate on hand-blown glass while Karhula glassworks would take over all automated glass production. The plans which had been around as early as 1933 were delayed because of WW2, though working methods and furnaces’ were modernized anyways in 1937. Some of the changes at the Iittala glassworks included the conversion of a single special crucible furnace and the old 4 crucible furnace into 6 crucibles. An 8 crucible regenerative furnace was also built but the substantially increased output did not change the fact that all exported Iittala products were still sold under the Karhula brand and within Finland Iittala products were still sold under Karhula-Iittala. After the taking over of the Viiala glassworks by Karhula Oy and Riihimäen Lasi Oy a separate furnace for blowing electric lamps was built, since the employees, as part of the deal went to the Iittala glassworks. During the Winter War and the Continuation War, part of the Second World War, production came to a halt due to shortages of materials and workforce. Production restarted in 1946 and factory modernization was continued by Antero Järvinen and in 1947 a new gas centre and compressed air system was built. The special single crucible furnace was converted into a day tub and the 6 crucible was upgraded to 8 crucibles. Flame cutting was introduced, allowing for cleaner cuts than the cracking method. Järvinen also started to push an agenda to make design more prominent within the Iittala glassworks. This was continued when Håkan Södermaström became the administrator in 1950 and further pushed the Iittala glassworks to apply design to the entire range of products. With much of Ittala’s production being lamp glass for the international market Valto Kokko was hired in 1963. He was not only responsible for designing lamp glass and printed matter but he was also involved in advertising and exhibitions. Though lamp glass manufacturing profits were shrinking, a separate lamp glass factory was built in 1971. The new factory was used to produce lights for homes and public facilities. Industrial lights were first produced in 1975 for Ahlströms Varkaus paper mill. Sales of their products in Finland were also continuously under competition from the ever growing import of foreign glassware but Iittala enjoyed continued success until the oil crisis of the mid-1970s, when it had to cut back on its operations. In 1981 Iittala was Finland’s largest exporter of glass accounting for 77% of exports. In 1983 Iittala glassworks had 530 employees. Glass manufacturing was relocated to another Ahlström business unit in 1985, since Iittala was now focused mainly on exports. In 1988 the owners of the Iittala glassworks, A, Ahlström Corporation and Wärtsilä, the owners of Nuutajärven Lasi, the Humppila glassworks and Napapiirin Lasi merged into Iittala-Nuutajärvi Oy. A, Ahlström retained 70% of the shares and Wärtsilä 30%. Product collections stayed the same but the brand name Iittala was used for exports. In 1990 Iittala-Nuutajärvi Oy was sold to the Hackmann Group who had obtained Arabia and Rörstrand-Gustavsberg. The Designor business area of the Hackman Group was renamed to Iittala oy ab in 2003. In 2004 the Italian ALI Group bought the Hackman Group and sold the business area Iittala oy ab to the Iittala management and the international private equity investment company ABN AMRO Capital. 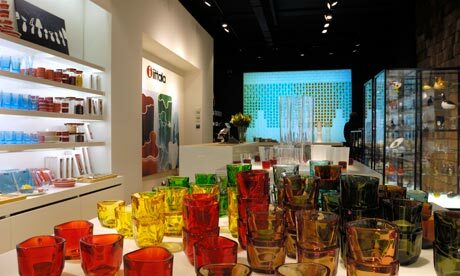 In 2007 Iittala was bought by Fiskars and is now, a group within the Fiskars Corporation. The operative management of Iittala holds 3 percent of the shares. Structurally the Iittala Group has been merged into Fiskars Corporation and within the main 3 division of Fiskars are Home, Garden and Outdoor.